About an hour before dinner was served my children started begging to go to the pool one last time today! The weather was warm, the house was booming with children and my husband was working late, so the answer was “yes”. We had a few extra friends over and I needed something quick to serve for dinner. I transformed my boring old chili in the crock pot into a fabulous dip! Try this hearty dip for dinner and know people are going to love it. I bought everything at #aldi so it was affordable, yummy and fun way to serve up dinner during summer time! once everything starts to heat up I add, chili spice, a tablespoon of sugar, salt and pepper to taste and fresh cilantro. After it is spread add the chili dip to the pan,cheese to go on top follow up with the fresh cilantro and thinly sliced lettuce. The final touch I squeeze a few limes on top! 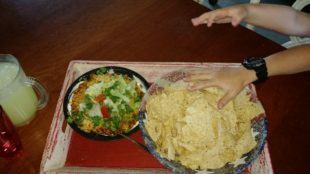 The kids loved it, and ate with chips, I cooked some pasta for my football players to add the chili dip on top of that! I served a bowl of hot pasta on the side for those who wanted traditional chili and pasta, so there was plenty of food!